Is it finally time to live your dream of flying? L ive the dream. With your Discovery Flight, you’ll be at the controls of an airplane. You will taxi the aircraft to the runway and then, with the help of your instructor, actually take off at the controls. There is no better way to discover the joy of flying. Whether it is a one time experience or the start of a journey towards becoming a pilot for recreation or as a career, the memory of flying is a wonderful experience to treasure. 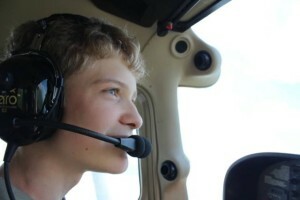 You at the controls of a Cessna 172! Join the elite few who have actually piloted an aircraft! After a short briefing on aircraft controls, instrumentation and safety, you will take the controls and fly one of our Cessna airplanes from the pilot seat! Of course, one of our Certificated Flight Instructors will be with you for guidance and safety! Enjoy a bird’s eye view of the NJ/NJ metro area during your 15-20 minute Discovery Flight.